The condition of a Hailey man, injured in an Oct. 12 accident at the Sun Valley Sinclair service station, has improved at Saint Alphonsus Regional Medical Center in Boise. Charles Bruce Innes, who was in critical condition for more than a week following the accident, was listed in serious condition Tuesday at Saint Alphonsus. Innes, 71, is better known as Bruce Innes, a local musician with a long history in the music industry in the United States and Canada. Innes was injured at about 8:30 a.m. on Sunday, Oct. 12, when a red Land Rover driven by Francis Gerlits, 83, of Ketchum, backed into him and his vehicle, over a fuel pump and into a third vehicle. Innes was initially transported by Ketchum Fire Department ambulance to St. Luke’s Wood River hospital and flown from there by air ambulance to Saint Alphonsus. 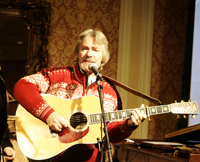 Innes has appeared with numerous other music notables, including Joni Mitchell, Michael McDonald, Crosby, Stills & Nash, Ray Charles, The Carpenters, Seals & Crofts, Waylon Jennings, Glen Campbell and Bobby Darin.